Attention, ninth graders: John Houston MA ’03 has an eye on you. He’s watching your test scores. Your grade history and current grades. Your attendance. And he’s definitely watching whether you missed any assignments. “Missing assignments is a huge one for us,” says Houston, an academic intervention specialist employed by Ingraham High School in Seattle. 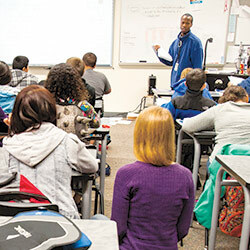 Houston works with a team of “student support specialists,” looking at these factors with the goal of getting ninth-graders to pass all their core classes. The specialists are future school counselors, studying in Seattle Pacific University’s School of Education. They’re also hired through University Tutors for Seattle Schools, a nonprofit founded and directed by SPU Professor of Education Greg Fritzberg. 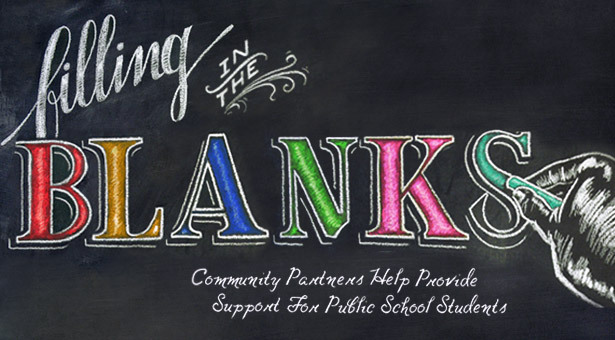 Created to fill a need in public schools, UTSS is just one of many community organizations across the nation that are stepping in where public schools are lacking either funding or resources to provide intensive support to struggling students. 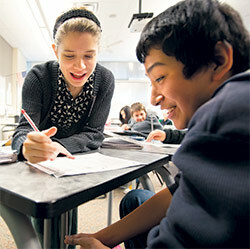 At Denny Middle School, SPU student Olivia Birk talks a student through a math assignment. Birk is employed by University Tutors for Seattle Schools. “Assisting these students as they dream about and prepare for college is UTSS’ mission,” Fritzberg says. During the 2013–14 school year, UTSS will provide about 20,000 hours of academic help to Seattle public school students. Meanwhile, the 65 university students employed as tutors gain income and job experience while pursuing their own education. 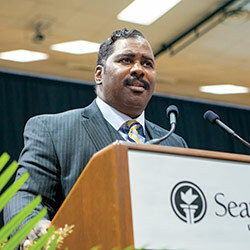 Funds from the City of Seattle, Seattle Public Schools, and the state of Washington support the program. Fritzberg sees this arrangement as beneficial for everyone: Students get help in core subjects. Tutors get a paid job with valuable experience. The student support specialists also venture outside the classroom, making home visits to families of ninth graders, trying to get family members involved in supporting the students’ education. But quality education requires more than an investment from individual parents and teachers, emphasizes Maridada. It requires the commitment of an entire community. One of his strategies for turning around troubled schools and districts: build as many partnerships as possible. For instance, when Maridada was superintendent of a Detroit-area school district, he partnered with local colleges in both districts to create an early college program in which high school students could earn an associate’s degree by the time they graduated from high school. In Pontiac, his team created partnerships with — among other institutions — the Detroit Symphony, Detroit Zoological Society, and the Cranbrook Institute of Science, a natural history museum. “Many of our parents, even though they lived maybe 5 miles away from Cranbrook, they didn’t think that Cranbrook was for them, so their children hadn’t been exposed,” Maridada says. Parents were given free museum memberships, and the museum gave hands-on classes to students one day a week. Now, as director of national education policy, practice, and strategic initiatives at the Children’s Defense Fund in Washington, D.C., Maridada focuses on “scaled-up” innovation at the federal level, supporting CDF programs such as Freedom Schools, a summer learning program that brings public school students together with universities, churches, and other organizations. Thomas Maridada of the Children's Defense Fund encourages listeners at SPU's Day of Common Learning to get involved with helping youth. While partnerships between faith-based organizations and public schools may sound unlikely, they can thrive if partners are willing to put common goals first. Laura Wright ’09 coordinates the Homework Center at Rainier Beach High School, which serves an average of 45 students daily, and she coordinates six UTSS tutors. Though she is employed by Urban Impact, a multi-church-supported ministry that has been in Seattle’s Rainier Valley for 25 years, Wright spends nearly all her time at the high school. Because Urban Impact is structured around reconciliation advocate John Perkins’ ideas about Christian community development, the ministry looks for community assets rather than problems that need to be fixed. “The schools we work in really trust our presence,” she says. Nearly 190 students have accessed Homework Center at least once over the past two months, and 60 percent of the school population was served last year. “We want all of our programming to be youth-led,” Wright says. And by letting youth take the lead, other opportunities for service have emerged. The attendance campaign made students aware that some of their classmates were having trouble finding transportation to school, so they went to advocate before the Seattle School Board for better transit. This is the kind of model Owen Sallee ’99, EdD ’06, of SPU’s John Perkins Center hopes that Seattle Pacific students will learn as they serve as community partners, volunteering at Urban Impact and other locations around the city and developing relationships with youth. UTSS tutor Sierrah OldenKamp listens alongside students in the math classroom at Denny Middle School. Sallee, who coordinates SPU’s Urban Involvement program, first connected with Urban Involvement as a student volunteer with a church youth program that’s now known as Union Gospel Mission’s White Center Remix.